Class of Admission (Part 1, Question 14 on Form I-90) describes the visa category that was used to admit an immigrant to the U.S. as a permanent resident or conditional permanent resident. You can find the Class of Admission code on the front side of a newer green card right under “Category.” It is typically one or two letters followed by a number, (e.g., IR2). 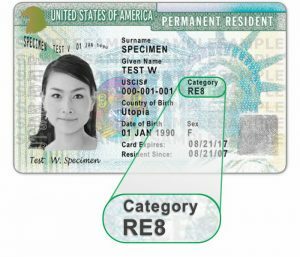 For example, RE8 would be the class of admission for the green card holder shown in the image below. USCIS has changed the location on the card over time. You may find the code in a different place on older cards. For examples of more types of green cards, use CitizenPath to prepare your Form I-90. Date of Admission is a closely related piece of information. It’s simply the date that USCIS granted you permanent resident or conditional permanent resident status. Note: You may have entered the country on a non-immigrant visa and adjusted status to permanent resident. In this case don’t confuse your initial nonimmigrant visa status (e.g. tourist) with the immigrant visa category under which you became a permanent resident. Get 25% off preparation fees if you start Form I-90 with CitizenPath today. That’s less than $58 for a neatly prepared I-90 and custom filing instructions… and you’ll be done in about 15 minutes. 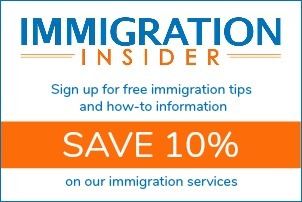 Start Form I-90 now and use coupon code “I90SUPPORT” at checkout.